From a non-sushi lover to huge sushi fan, that’s me. Five years ago, I would never venture to a Japanese restaurant or a sushi bar, things changed slowly when I started visiting some really good and authentic sushi restaurants. Now I visit some of the best sushi restaurants in town for my sushi fix. 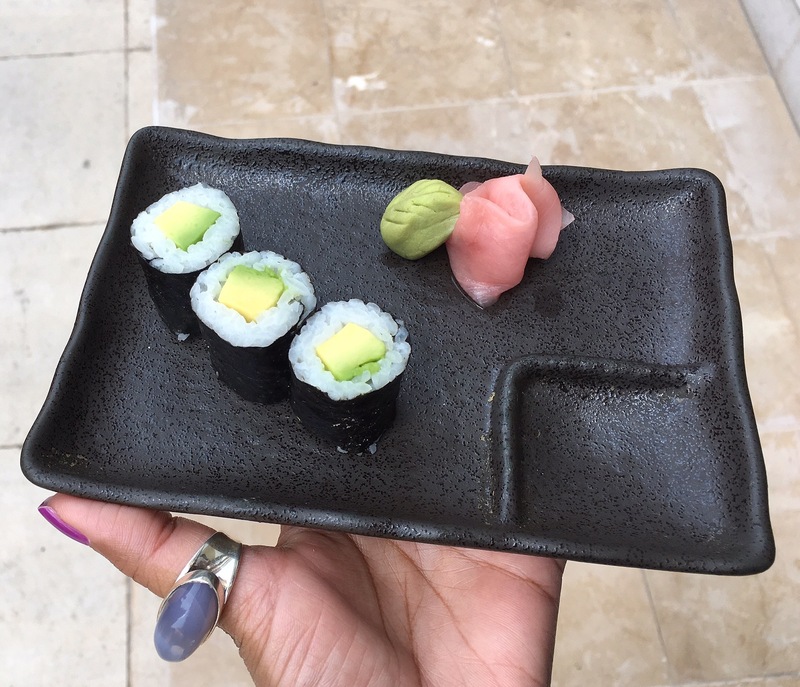 Couple of days ago, I visited a new sushi outlet called Sushi Express Cafe that is located in the Ground Floor of Gloria Hotel at Dubai Media City. They also have another branch in JLT. Sushi Express Cafe is a casual dining restaurant with simple and minimalistic decor. The restaurant is small and cosy with indoor and outdoor seating area. They also have a live sushi counter. Our mission as the number one Japanese restaurant in Dubai- is not to only provide great food selection, but also offer efficient and superior customer service satisfaction-which is our top priority. “Sushi Express Cafe” is a restaurant of choice for the mature and adult crowd, couples and singles, young and old, males as well as females. We are well aware that we should be able to maintain or develop our strength only when we can sustain increasingly strict customer requirements and continue to offer high quality products at reasonable prices. 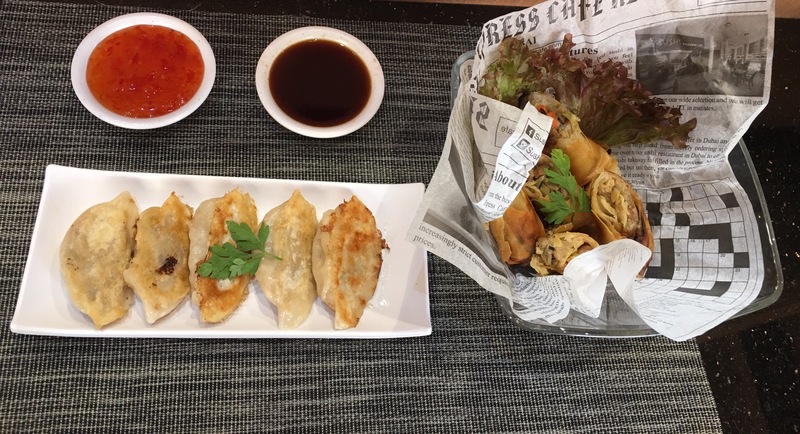 Their menu offers good variety, Sushi Express Cafe offer soups, salads, appetizers, maki rolls, nigiri, temaki, Ramen noodles, Teishoku grills, Yakitori and much more. 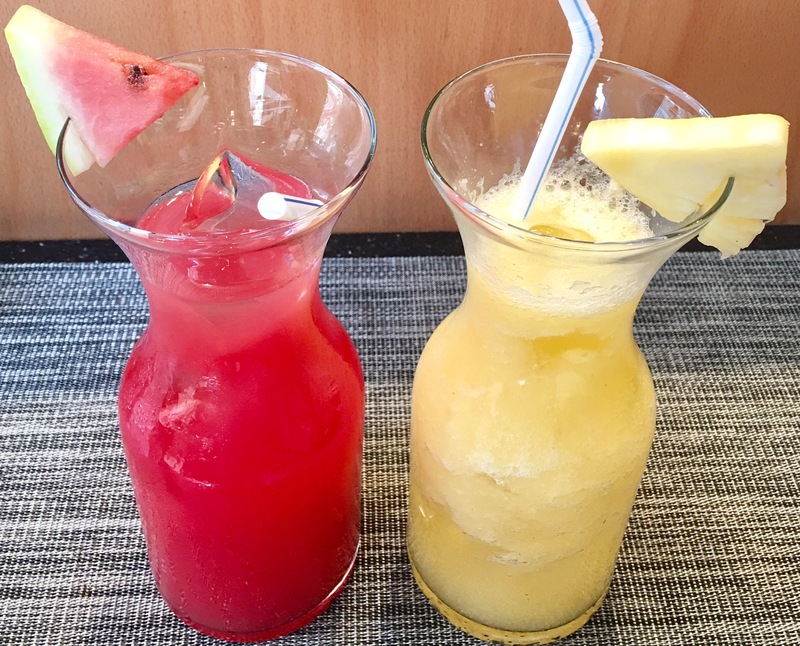 We ordered freshly made Watermelon Juice and Pineapple Juice to drink. As I am a vegetarian, I only tried vegetarian dishes in the menu and my friend Gill tried the non vegetarian dishes. I am happy to say that vegetarians also have good options at this place. Juicy and delicious pan-fried vegetable Gyoza. Harumaki, the crispy Japanese spring roll was filled with crunchy veggies. It was served with sweet chili sauce. Avocado maki roll was freshly made and tasted super delicious. My friend tried their ‘Express Hot’ which had a nice blend of crab meat and mango wrapped in seaweed with a tempura batter. She said that the seaweed had a crisp bite with tempura coat, rice, crab and mango, yet it regained the originality. It was like tempura and maki in one bite. I had stir-fried Yakisoba noodles with vegetables for my main course. It was a wholesome meal flavored with sweet and savory sauce. Gill had Ankake Chahan, which is a fried rice with crab meat. She said it was a well presented dish with original flavor. According to her additional flavor will certainly enhance this dish. 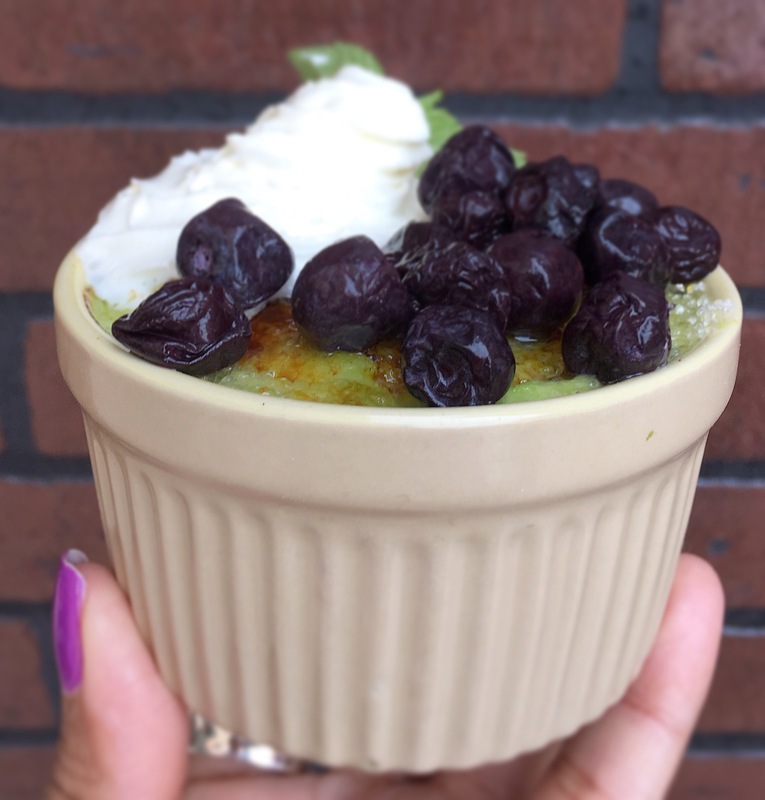 Avocado Brûlée is a must-try dessert for all avocado lovers. It had rich crème brûlée made with avocado, coconut milk, vanilla syrup topped with berries. 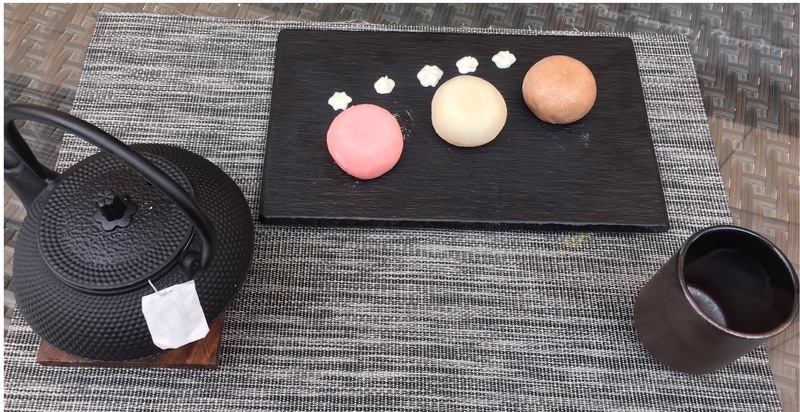 Utterly delicious Japanese rice cake Mochi Cream was served in three amazing flavors like strawberry, mango and chocolate. We were also served a complimentary pot of Green Tea with Mochi. It was a perfect way to end our lunch at Sushi Express Cafe. Overall, we had a wonderful dining experience. The food was not only delicious and fresh, the presentation was stunning too. The service, The pricing and the atmosphere was also great. Now I know where to go for all my sushi cravings.